Pittsburgh’s hottest hipster dance couple, Anna Thompson and Taylor Knight, a.k.a. slowdanger (like the roadsign), will present the fifth installment of their “memory” series June 9 at the New Hazlett Theater. memory 4, part of the theater’s CSA Performance Series, follows 2013’s memory 0: . . . and memory 1: Luminosity; 2014’s memory 2: D E M O; and 2015’s memory 3: swimmoon. Conceptually, that throughline is the exploration of memory and how it is defined and redefined with each passing moment. Movement-wise, each work in the series took a different path. The 70-minute, multimedia memory 4 represents the biggest deviation so far in that the previous works were duets danced by Knight and Thompson. This time the cast also includes dancer Jasmine Hearn and percussionist/performer PJ Roduta. Although abstract in its approach, says Thompson, the choreography hints at how we perceive memory via the movement phrases that are shown, varied upon, and then repeated. 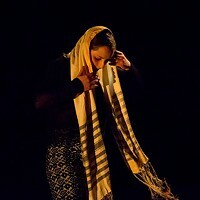 Cinematic and atmospheric both visually and sonically, the memory series features choreography that is rooted in structure, but informed heavily by improvisation. The works contain an original and often ethereal mix of field recordings and audio samples culled and manipulated by Thompson and Knight. memory 4 will also find the performers vocalizing and creating sound live. Additional layering will be added by local artist Celeste Neuhaus, who created sculptural objects that the dancers use, and video projections by Mike Cooper and Mario Ashkar. 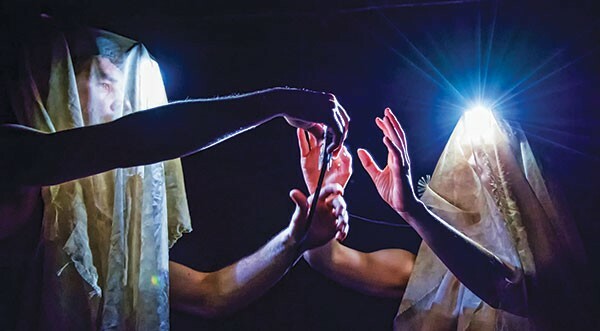 In an excerpt of memory 4 I saw recently in Erie, Knight and Thompson occupied a darkened stage wearing headlamps, and danced a butoh-like duet that seemed to visualize the fragmentation of memory. It was both surreal and compelling — something the full work promises and then some.